A view of Halls Rd. today looking north. Photo courtesy of the Yale Urban Design Workshop. We thank the Halls Rd. Improvement Committee for sending us these FAQ’s and, as always, we look forward to hearing reader’s thoughts on them. Question 1: Why should the town get into the development business? Isn’t that better left to private developers? Answer: It shouldn’t and yes. We are not suggesting that the town take charge of development on Halls Road but, rather, that we take steps to encourage private parties to develop the neighborhood in a manner and direction that will comply with current requirements (safety, complete streets, ADA accessibility, etc.) and best serve the needs of the community. These steps would include adopting a “master plan” and guidelines for future development, investing limited funds in infrastructure and public spaces, and making appropriate changes to the town’s zoning code and Plan of Conservation and Development, all intended to allow for and encourage private developers to invest in upgrading existing structures and undertaking new construction. Question 2: Halls Road is fine the way it is—why is the town considering changes? Answer: Halls Road, our central commercial center, has developed haphazardly over many years. It is inhospitable to pedestrian and bicycle traffic, portions of it are esthetically unattractive or looking tired, and residents currently have to leave town to seek products or services they cannot obtain locally. iv. provide public spaces for civic events and recreation. The ultimate objective is to create a vibrant town center that has more to offer the citizens of Old Lyme and is one we can be proud of. Question 3: What is the new plan for Halls Road? Answer: The plan does not yet exist; it is still developing and is flexible. The goal is to reach majority agreement on what the Halls Road neighborhood might ideally look like. Initially, we held a public meeting to obtain feedback regarding those elements residents would like to see included. The meeting produced many ideas, including the ability to park once and walk the entire road, creation of green space with a community gathering area, development of mixed-use facilities (or a mix of uses), and esthetic enhancements. We recently held a second public meeting to gain further input, and will hold more meetings in the future. The Yale Urban Design Workshop is assisting us in developing a master plan, but we need substantial input from town residents and stakeholders in order to come up with sound ideas that enjoy widespread support. Question 4: What is the process for developing a master plan? Answer: Once we have enough public input to begin to see the outlines of a plan, we will present these ideas to local and state governmental authorities for input and necessary approvals. At the town level, the plan will likely need buy-in from the Board of Selectmen, the Board of Finance, the Zoning Commission and the Planning Commission, as well as amendments to the zoning regulations and the Plan of Conservation and Development. At the state level, we will need approval from the Department of Transportation, which owns Halls Road. A master plan can be finalized only when it enjoys broad public support and satisfies governmental requirements. Question 5: What is the anticipated time-frame for implementing the plan? Answer: The Committee intends to develop a master plan and set of guidelines for the future development of Halls Road. The plan would consist of several phases to be pursued in an orderly sequence over time, so that work done in one phase supports, or at least does not interfere with, improvements to be made in a subsequent phase. Each phase will also be expected to “stand on its own,” in the sense that its completion will add value to the town even if subsequent phases are not pursued. For example, an initial phase might consist of improving access, such as by adding sidewalks, a bike path, improved signage, and a pedestrian bridge over the Lieutenant River. The timing and exact nature of subsequent phases, and the changes that will be implemented, will of course depend on future events, including available funding and the decisions made by private developers and property-owners. Hence the timing is unpredictable, but this is surely a multi-year process over which the master plan will evolve, perhaps substantially but consistent with the guidelines, to address changes over time in the town’s commercial and residential needs. Question 6: Will the plan result in unfettered growth and additional traffic? Answer: We view this project as a rehabilitation of the Halls Road neighborhood, and any potential growth must be managed to fit the needs and the character of the town. 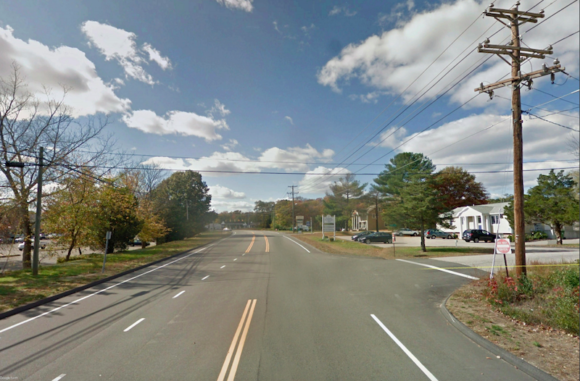 For example, we would encourage architectural design in keeping with the small New England town flavor of Old Lyme. There is no intent or appetite to change our “town business center” into a dense retail environment but, instead, to attract a limited number of businesses that our neighbors would like to enjoy locally (e.g., a restaurant, coffee shop, bakery, jewelry store), and enhance the patronage for existing businesses. These changes would increase auto traffic somewhat. However, we intend to limit congestion through a design that encourages folks to park once and then walk the neighborhood, rather than drive from place to place. Question 7: How can this plan survive the overflow traffic from tie-ups on I-95? Answer: These tie-ups will not be materially exacerbated by a normal increase in Halls Road traffic, and they occur infrequently enough so that they should not discourage business development along the road, which is currently a pass-through. The plan might call for locating parking behind the main shopping and business buildings and creating tertiary access roads and walkways, which would mitigate the Halls Road bottleneck. For example, we might explore the construction of a local access road south of the current Old Lyme Marketplace buildings (the Big Y plaza). Question 8: Will private property owners be required to make changes or invest money? Answer: No one will be required to do anything. Other than the state right-of-way along Halls Road, the real estate in question is privately owned and changes must be voluntary. The expectation is that property owners will see the advantages of making changes to their property in order to increase profitability. Alternatively, they may discover that they can sell their property at an attractive price to a motivated developer who is ready to invest in a significant project consistent with the town’s guidelines. Question 9 How will the plan be financed and how much will it raise property taxes? Answer: The objective is to have this project be tax neutral or result in a tax rate decrease because of an increase in the tax base. The public infrastructure would hopefully be financed, at least in part, through state and federal grants, and from new tax revenue generated by the new construction, although this might initially require town bonding. The private development will be financed by developers and property owners, who may also help pay for common amenities such as wastewater management, sidewalks and landscaping. The town might consider creating a Tax Increment Financing (TIF) District like the one just approved in Old Saybrook, under which new tax revenue generated by new construction may be allocated, in whole or in part, to improvements in the district and to financial inducements to developers. In all events, any material town expenditures will have to be approved at a town meeting. Question 10: What happens if I-95 is widened in the future or the exit or entrance ramps are reconfigured? Answer: That question is impossible to answer, not knowing what properties the government might want to seize by eminent domain. However, given the current economic condition of the state and the absence of any such plans, we do not think it prudent to forego changes benefitting the town because of a remote, future risk. Question 11: What do you mean by residential housing on Halls Road and why is it needed? Answer: We would seek to enable the construction of reasonably-priced rental properties and condominiums. Many concerns have been expressed about young people who want to move to town (perhaps after college) or out of their parents’ homes, and older folks who are retiring or downsizing and would like to remain in Old Lyme, but cannot do so because of the lack of appropriate housing. The Halls Road neighborhood, as envisioned with expanded resources, offers an ideal location for this housing, since both groups prefer to live in areas where they can walk to stores, restaurants, banks, recreational facilities and other amenities. Furthermore, the retailers in the neighborhood would surely benefit from the presence of these residents. Question 12: How do you intend to address increased wastewater? Answer: A good question that must be addressed, but there are solutions other than municipal sewers. For example, it might be feasible to construct a community treatment facility that would process the wastewater to a condition where it can safely be discharged. Question 13: How can the town validate what types of improvements would be the most successful for the town, its businesses and the tax base? Answer: One way would be to retain a professional consultant such as CERC (the Connecticut Economic Resource Center) to perform an economic review of Old Lyme and the region, and recommend what improvements would likely be most viable. Such a study would give our residents and businesses guidance on the development possibilities and the impact on taxes. It would also serve as an attraction to serious investors, both for its content and as an indication of the town’s seriousness about supporting the project. Question 14: How can I have input to the plan or keep updated on the progress? Answer: There are several ways for you to stay informed and be heard, and we hope you will utilize them. We will hold more public meetings and focus groups, and intend to develop a page on the town’s website where we can provide updates and receive input. You can also send an email to the Halls Road Improvements Committee at hallsroadcommittee@oldlyme-ct.gov, or ask to speak personally with any of us.